Are you looking for an engaging reading activity to do on those first few weeks of school? 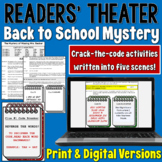 Check out this Mystery Readers' Theater script that contains parts for 25 readers! The Readers’ Theater script is set in a classroom during the first week of school. Codes are written right into the script. Frankenstein - Readers Theater Script Based on Classic Mary Shelley novel!